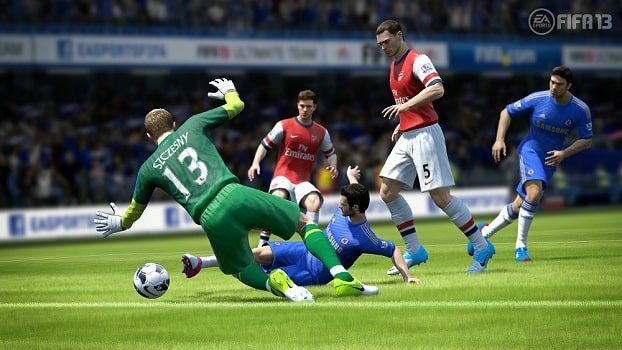 EA Sports are developing FIFA Soccer 13 and Madden NFL 13 to release alongside the launch of the Wii U, it has been confirmed. Shown during a live demonstration at the EA Summer Showcase, FIFA Soccer 13 will target players of all abilities through introducing new ways to play. Co-op Mode sees one player managing whilst up to four others play, Team Management Control will feature an interactive radar to send players on supporting runs, attacking or defensive, and touch screen control to alter tactics, formations or make substitutions, whereas Manage Match will see the player directing players from the sidelines and giving half-time talks. Shaking the GamePad activates Touch Screen Shooting, allowing for pinpoint accuracy, whereas lifting the controller will allow you to look around you and aim the ball on set pieces and penalty kicks. You can also view a statistical analysis of the match and any player at any time, enabling you to make informed decisions. Whenever your friends are online you can immediately invite them to play, or message them in real time using touch screen typing. Meanwhile, Madden NFL 13 delivers an all-new Connected Careers mode where you can build your own legacy as a player or a coach, or seek to relive the glory of an all-time legend. The new CBS commentary team of Jim Nantz and Phil Simms makes every game feel like an authentic NFL broadcast, calling the action from the 3D booth. Exclusive features to the Wii U include streamlined playcalling, pre-snap adjustments and personnel management – all performed directly from the Gamepad touchscreen. “We challenged our teams to develop innovations designed specifically for the Wii U, and to create new ways to play that would bring players of all abilities together,” said Andrew Wilson, Head of EA Sports.